A commenter here mentioned swizzle sticks, saying, "remember when bars put PLASTIC stirrers in drinks, not those tiny straws? They were very different, various colors, many had name of the bar. They're like jewels. Wish you'd write about them sometime." This isn't a whole post about swizzle sticks, but I did come upon one--at Sardi's "Little Bar" in Times Square. It's not the most exciting swizzle stick in the world. It's black, with a ball on top, and doesn't bear the name of the bar on its shaft. But it's a nice touch in a great place. Sitting in the Little Bar on an afternoon, before the theater crowd rushes in, actual theater people come to drink. (The "theater crowd" comes to see a show, while "theater people" create the shows.) Four other drinkers share the bar with me on this day: a gray-haired producer, a gray-haired actor, a gray-haired writer of musicals, and a singer who looks old enough to dye her hair. This is not the Dave & Buster's gang. It's an old-timers' place. Joyce Randolph, the last living Honeymooner, has made it her regular place. And the bartender, Jose, has been handing out the swizzle sticks for 20 years. The theater people drink while memorizing lines in bound scripts. They take typewritten scripts out of manila envelopes to show each other how the writing is coming along. They talk about languishing in industrials, doing dance arrangements in small productions, and recall trying to break into acting back in the day, when rent on a Central Park West apartment cost $80 a month. And they give each other advice. As one says, "I was put here on Earth to run the world, and I do it one person at a time, but nobody listens to me." Sardi's Little Bar is one of the last places in Times Square where you can drink and be in the real New York at the same time. McHale's was one of those places. There's still Jimmy's Corner. But the Little Bar is extra special--it's deep New York, old history, an oasis from the multiplying chaos of the city. There's "out there," and then there's "in here." "How was St. Patrick's Day in here," the gray-haired actor asks the bartender (this was weeks ago now). "Was it crazy?" "Oh no," says the bartender, "Thank God we don't get that crowd. Thank God." "It was crazy out there," says the actor. "I nearly killed three people on the street." "Thank God we don't get that crowd in here." Great write up. I even have glass ones with the writing on the side. Wonder Tavern 968-3rd Ave @ 58th St. Thank you. The Little Bar (what a gem!) is Joyce Randolph's place. "Jeremiah's" is mine to hang out and savor the real deal (albeit from afar). Lovely reminiscence. thanks Jay. what'll ya have? Great one Jeremiah. Sardis also has good food and I like the place, although I have not been there in quite a while. Where is the "like" button? :) I collect a bit of old barware and swizzle sticks. And inherited a few from the golden Las Vegas years from the in-law fam. What a happy post, J. 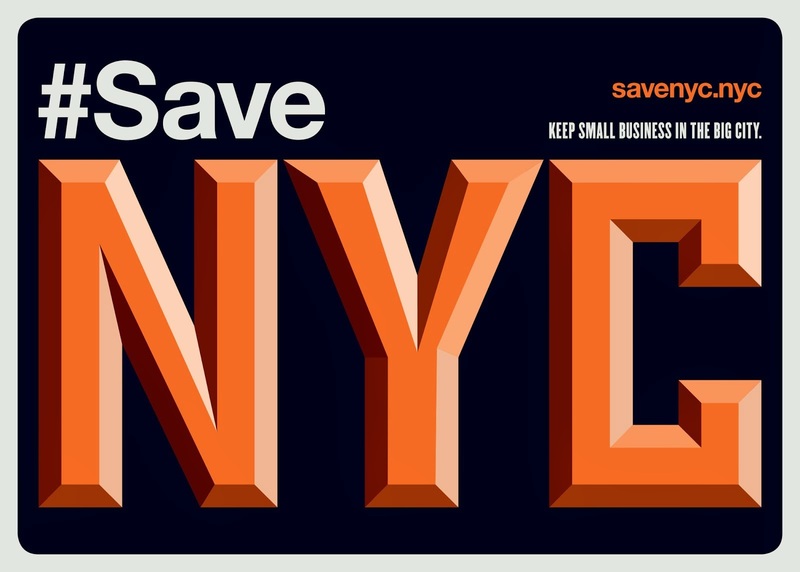 For years, New Yorkers have written off Sardi's as a "just" a tourist haunt. The trick, as you discovered, is to drop in during the slow hours. Then Sardi's still feels like what it is: one of the Theater District's last surviving links to an older New York, and a good old dame of a place. The food is pricey and nothing special, although actors can still eat from a reduced "Actors' Menu" by flashing their union cards. I've had that Joyce Randolph article in my files ever since it appeared in the Times. It still touches me. Those restroom signs are the best. Need to pay them another visit. The bar, not the restrooms. Practically the last oasis standing in the hell that is Times Sq. 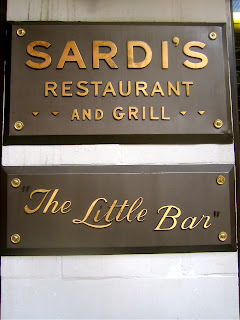 It's a mystery why Sardi's is still this good, but it is. José is one of our all-time favorite bartenders, a hard-working and elegant man. Last time I was in there we got to talking about what a tough time our President has been getting, and he looked like he was going to kiss me when he realized I came to praise Obama, not slam him. This sounds like my kind of place! I wonder if those places that Anonymous got glass swizzle sticks are still there? I don't think I've ever seen a glass swizzle stick and now I must find one! Great post! My father has a huge collection of swizzle sticks and cocktail napkins dating back to the 50s and 60s (from many cities)...they amused me as a kid, but now I'm thinking we ought to mount them under glass or something. Jose is one of the essential New Yorkers. Great post! I'm the commenter on swizzle sticks. My collection has many of places gone by. Sardi'a EAST. Top of the Sixes. Trader Vic's. Swizzle stick people, it'd be great if you could take photos of your NYC-specific sticks and send them in, or add them to this blog's flickr pool, so we can enjoy them. Would love to see them. @Anonymous 1:51pm: Please send in some photos of your swizzle sticks, I'd love to see your collection. They sound cool as hell. Goggla, you too! All of a sudden I'm obsessed with swizzle sticks! @Jeremiah - I'll contact my dad. I do remember many of the sticks and napkins being from NYC (and Chicago). He used to host happy hours where guests had the pleasure of picking out their swizzle sticks (and were told sternly not to break them). thanks Goggla--can't wait to see those babies. J, back to matchbooks for a minute. In my collection, I have one from ARTHUR. Does anyone remember ARTHUR? Well before Studio 54 et al, there was ARTHUR, owned by Sybil Burton Christopher. It was the middle of the decade, the 60's were just beginning to swing. Girls wore short dresses and geometric haircuts. Wish I had a swizzle stick from there! I have alot of old matchbook covers, swizzlesticks and even some old menus from my grandmother who saved everything...stay tuned for some photos in your pool! thanks Lisanne. to anyone who's putting swizzle sticks, matchbooks, napkins, etc., in the photo pool, please just drop me a line when you do. i don't look at the photo pool as often as i should and don't want to miss it. thanks. Checked out Matchbook Museum via EVG. Once, in NYC, there were match books with: HELP STAMP OUT VD! More ephemera: a neighbor had shopping bags: JUDY BOND IS ON STRIKE. DON'T BUY JUDY BOND BLOUSES! Said the bags were once seen all over the city. You can still get nice, heraldic-topped swizzle sticks in the King Cole Room at the St. Regis. Admittedly the prices are a bit stiff for just a swizzle stick, but you can nearly make a meal from their nut bowls--the macadamias alone. 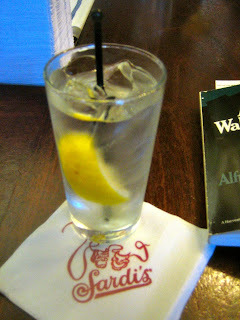 Had some nice times at Sardi's while a college student in NYC. I couldn't really afford the menu prices or even the price of a drink, but I managed to weedle a "split" beer out of them now and then. The fine British actor Alan Webb fed me at the bar a few times, as I probably looked like a starving waif in 1968. 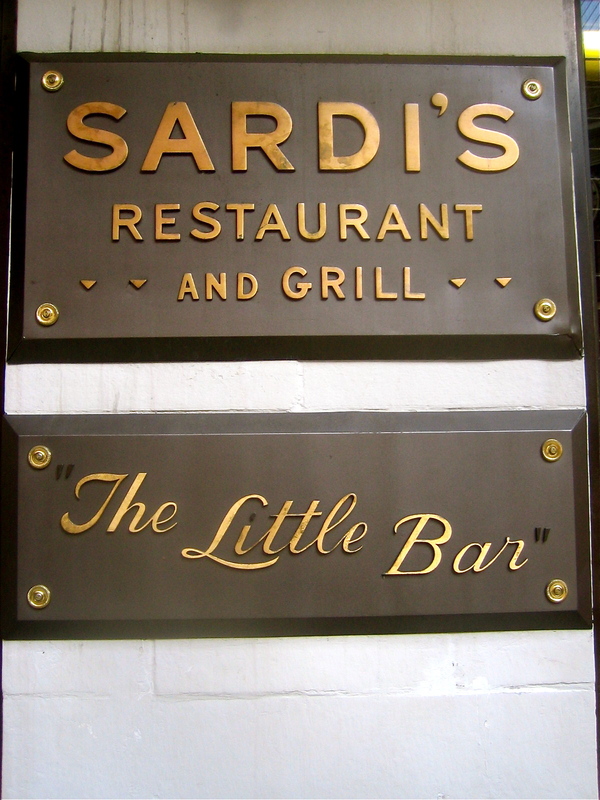 Nice memories of Sardi's past. Vince Sadi Jr. was a fine host.